CBN Wheels Premier Supplier | Eagle Superabrasives Inc.
Eagle Superabrasives is one of the USA’s premier superabrasive suppliers. We offer a complete range of CBN Wheels, Diamond Wheels, and CDX Wheels, covering a wide range of industries. CBN Wheels are composed of a man made material, cubic boron nitride. Diamond has almost always been the industry standard when it comes to a superabrasive material that can offer cool and clean cutting with a high removal rate. However, CBN has quickly taken the spotlight. CBN Wheels are great for high-speed grinding due to their high thermal resistance. It has a higher thermal resistance compared to its competitor diamond, meaning it will stay hard while working at high temperatures. Our CBN Wheels are being used in a wide variety of industries. To name a few of the industries that we currently supply: automotive and aerospace, semiconductor slicing and dicing and paper converting wheels. We can manufacture our CBN Wheels as thin as 0.2mm and up to a maximum diameter of 700mm(27-½”) any anything in between. Our chemist and engineers have developed an advanced bond system and exclusive formulations to ensure the integrity of the wheel bond. We also have the ability to produce wheels on more than six different core materials. 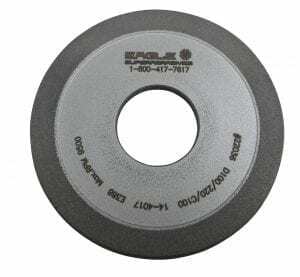 A CBN wheel from Eagle Superabrasives will increase your productivity and save you money. If you would like to read more about CBN Wheels click here. As you are looking for a high-performance wheel to fit your grinding needs, our friendly and experienced staff offer high-performance in customer service. We pride ourselves in unparalleled customer support and service with the dedication to provide our customers with high quality products and unmatched service. Contact us today!